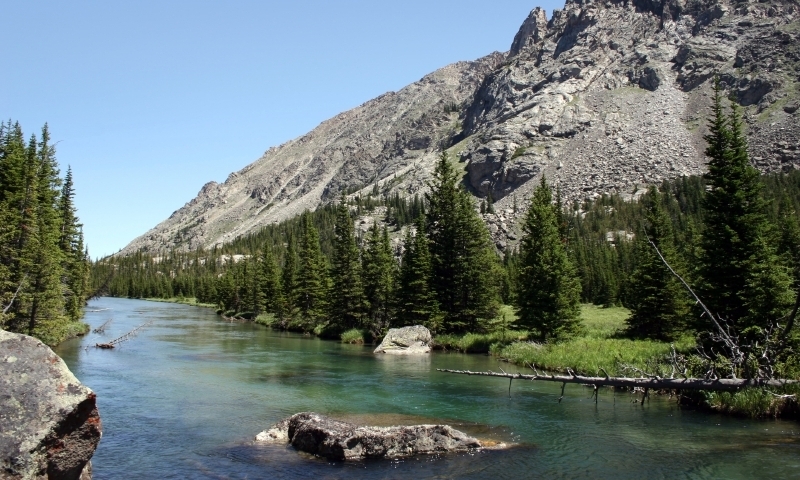 Flowing along Highway 212 and through Red Lodge, the sparkling mountain waters of Rock Creek offer fishing, hiking, camping and sightseeing for visitors. Located near Red Lodge, Montana Rock Creek flows along Highway 212. The clear mountain water of Rock Creek Montana flows along Highway 212 and through Red Lodge, Montana. Rock Creek passes through Custer National Forest, allowing visitors ample access to it’s waters for fishing, camping, hiking, and sightseeing. Rock Creek flows parallel to MT Highway 212, passing right through downtown Red Lodge. Visitors can access Rock Creek through one of the various Fishing Accesses including Parkside Campground (at the base of the Beartooth Pass) and Liver-Eating Johnston Park (within city limits). Most of Rock Creek runs through Custer National Forest allowing visitors to access it anywhere in the public lands. Contact the Beartooth Ranger District for more information. Rock Creek is accessible year-round. However, during the winter months, Rock Creek Canyon near Beartooth Pass is snow-packed and difficult to access. Rock Creek is narrow and shallow, perfect for wade fishing. After spring run-off, Rock Creek offers excellent trout fishing, including brook, cut throat, brown, bull and rainbow. Fly and reel fisherman can use pull-outs along Highway 212 throughout the Custer National Forest to access the Creek. The roads through Parkside Campground also allow access to the creek. Float fishing Rock Creek is not a great idea due to the many twists and turns, and narrow passages that will impede productive float fishing, and low water in the summer. Although Rock Creek consistently provides anglers with strikes all year, the Creek is busiest in June/early July as anglers pursue the salmonfly hatch. Even so, guides suggest the best fishing is in the Fall downstream when big, spawning brown and rainbows move from Clark Fork into Rock Creek, averaging 13” to 18” long, and are effectively caught with streamers. Some of the best fishing access sites include Water Birch Fishing Access, Bull Springs, Beaver Lodge, and Horse Thief Station. Rock Creek Canyon, just south of Red Lodge, offers several opportunities to camp and hike. Located in the Custer National Forest, much of this land is open to camping and hiking. Parkside Campground and Greenough Campground offer plenty of camping along Rock Creek. Hiking trails include the Greenough Trail and Parkside National Recreation Trail. These hiking and biking trails parallel Rock Creek as it flows through the canyon. Just out for the day? Visit the Liver-Eating Johnston Park along Broadway in Red Lodge. With barbeque pits and picnic tables, this park is the perfect place to eat lunch and play or fish in Rock Creek. The Beartooth Scenic Highway snakes up the Rock Creek Canyon, offering amazing views of the sparkling creek below. If you want to see this amazing canyon from several thousand feet above sea level, visit the lookout vista at the Beartooth Highway rest area. Beyond that, the drive from Red Lodge south on Highways 212 offers beautiful views of Rock Creek from the road. 6811 Highway 212 South ? Red Lodge, MT 59068 ?